Come and join the past with us! Do you want to learn about the past in a new way? Here at itshistorypodcasts.com, we are dedicated to bringing you some of the best history audio podcasts and writing around. We regularly create podcasts that introduce topics in history, we write books that complement our podcasts, we develop great blog posts, and we create an interactive magazine, History is Now. In fact, we don't think that anybody else is doing things quite like us! Click here and join us for free! 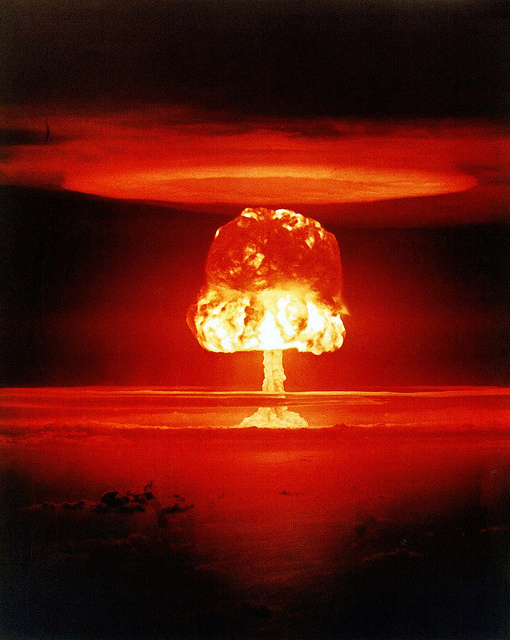 Castle Romeo (yield 11 Mt) - an atmospheric nuclear test carried out by the U.S. on 1 March 1954 at Bikini Atoll, Marshall Islands. It was the third largest test ever detonated by the United States. Joining us won't be that dramatic. But it will be fun! Even more reason to join us - Great joining bonuses! If you join us today, you will also receive a copy of our book on the introductory years of the Cold War for free! The book looks at the twists and turns in the great battle between the USA and USSR from 1945 to 1962. Today, new members will also get access to two members-only podcasts on the American Revolution! In the podcasts we look at the incredible events in the American Revolution from 1779 onwards. Interested? If so, click here to join us. As a site member, you will also receive updates on our latest news, including new podcasts, our best blog posts, and information about some of our favorite history sites. Come and join the past! Click here.